Flyweight Lightweight Transport Wheelchair . 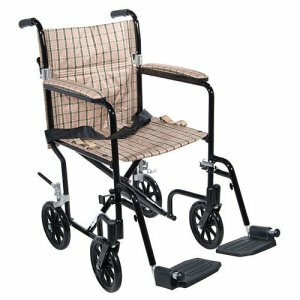 The Deluxe 19" Fly Weight Aluminum Transport Chair with black frame and tan plaid upholstery by Drive Medical weighs about 30% less than traditional transport chairs. Weighing only 19 lbs., this chair has a deluxe back release that folds down the back, and the lightweight aluminum frame combine to make this chair easy and convenient to store and transport. The composite, 8" caster wheels in front and rear with rear wheel locks, provide a smooth ride over most surfaces. Has a soft, plush upholstery, a seat belt for added safety and a carry pocket on backrest for easy and convenient transportation of personal items. Limited lifetime warranty. 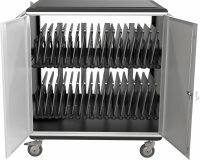 Width (Open): 22"; Width (Closed): 9"; Height: 37.25"; Seat to-Floor (Height): 19"; Back (Height): 18"; Seat (Width): 19"; Seat (Depth): 16"; Length with Riggings: 33"; Arms to Floor (Height): 29"